I rarely have seen a football team try to lose a game so many different ways, and not succeed. Today’s game between the Dolphins and Vikings was a classic but in a bad way. With a little over 6:00 to go in the 3rd period, Miami was up 14-0. The Dolphin defense had shut down Minnesota’s offense, and had scored a touchdown also after recovering a Bret Favre fumble in the end zone. As for Miami’s offense, they scored a touchdown on their first possession of the game. The Dolphins also had no turnovers for the first 38 minutes of play. Chad Henne was 9 for 15 with no interceptions. Brandon Marshall hauled in a 46-yard pass on the Dolphins first play from scrimmage. Brian Hartline caught three passes, one of which was Miami’s only touchdown. Ronnie Brown and Ricky Williams ran for 110 yards combined against one of the best rush defenses in the 2009 NFL season. That’s the good news offensively. Miami only controlled the football for approximately 24 minutes in the game and other than the opening drive, scored no points. Ronnie Brown and Ricky Williams both made critical fumbles. The one by Ricky set up the Vikings touchdown. Bottom line- Miami’s win was defensively based even though Adrian Peterson ran for over 140 yards against them. They intercepted Bret Favre 3 times, and made him fumble one more. 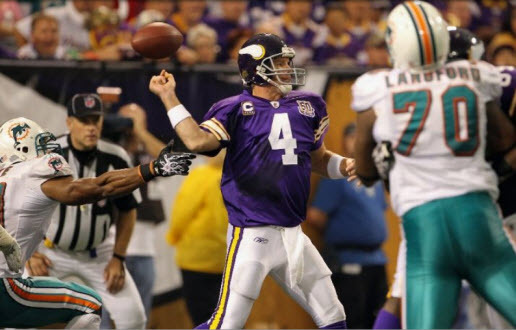 These were the most turnovers by Favre in a single game since the 2008 NFL season finale–against the Miami Dolphins. Favre was with the Jets then. Miami stopped the Vikings at the 1-yard line. They intercepted two of Favre’s passes inside the five. Minnesota drove inside the Dolphins 30 twice in the last three minutes of the game and were unable to score. Cornerback Jason Allen was on the receiving end of two Favre INTS. Is Allen who I and most everyone else have regarded as a draft bust(He was the Fins 1st round selection in 2006) for real or was today a mirage. Favre is a 40-year-old QB and has looked it so far this season. Miami plays the New York Jets at home next weekend. So far the fins are 2-0 but I remain skeptical about this season. You knew this day was coming eventually, but nobody saw it coming so soon. Bill Parcells has given up daily control of the Miami Dolphins’ football operations, according to a statement released by the team Tuesday afternoon. Parcells, who turned 69 on Aug. 22, had been executive vice president of football operations for the Dolphins since Dec. 20, 2007. He has two seasons left on his original four-year contract. It’s unclear if Parcells or Ireland will alter their official titles in any way, but that appears unlikely at this point. Whatever the reason for Parcells stepping down, I don’t much change in the Dolphins immediate future. The team still seems to bungle things too much to be more than a fringe playoff team or contender. They were two of over 20 players the fins cut loose yesterday. It wasn’t surprising news. Especially to Dolphins fans who questioned the selections of White and Turner on 2009 NFL Draft Day. I wrote this about White last year. Miami needs a wide receiver but White was a college Quarterback at West Virginia. He’s got good speed, and size is adequate. 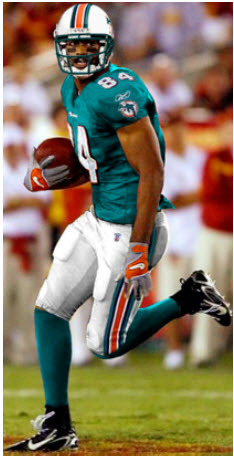 The need for the Dolphins at WR is indisputable but to draft a player who for it who didn’t play it in college. Yes Miami used the Wildcat last year, but that’s a gimmick offense that was the league was catching to to as the year progressed. The best WR on the board was Georgia’s Mohamed Massaquoi. I’d gone for him not White. 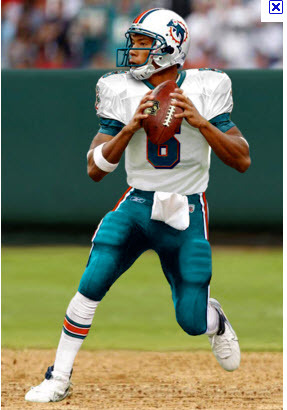 White is not a factor in the quarterback picture, though I got to guess that John Beck is unlikely to be on the Dolphin roster for the 2009 season. White is yet another player who doesn’t have a great fit at the NFL level. He isn’t tall or accurate enough to develop into an every-down quarterback and he is a raw receiver who is going to have to learn how to run routes before pushing for playing time in that kind of role. On the flip side, he can do a number of different things for your team and is the kind of player you want in your locker room. This pick is a definite a head scratcher for Miami Dolphin fans. The most memorable moment of White’s tenure in Miami was the concussion he suffered after a helmet to helmet hit in the 2009 season finale. White finished his time in Miami 0 for 5 as a passer, ZERO receptions as a receiver, and 81 rushing yards. That and his being a 2nd round draft selection label Pat White as a draft bust. Now this is what I wrote about Patrick Turner on 2009 NFL Draft Day. This is another puzzling choice made by Miami. 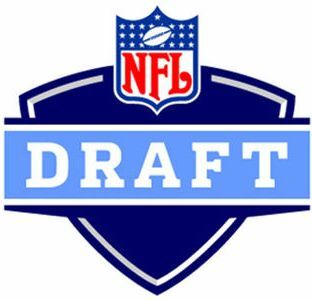 There had been a rush of Wide Receivers before the Dolphins made their pick, but there were much higher ranked(Scouts Inc. had him as the 38th best WR and he was the 14th selected) available receivers out their than Turner. Turner at 6’5 has size, but alot of question marks. Draft expert Mel Kiper questioned the Turner selection when it happened. Turner was even less productive than White in the NFL. Not one regular season down played. So Turner and White were both mistakes. The thing is, they were avoidable mistakes. It was obvious Miami was reaching on draft day. Other selections made by the new Tony Sparano and Bill Parcells regime are also questionable or works in progress. Take for instance the currently suspended Phillip Merling. He was a 2nd round draft selection in 2008. His legal problems, Achilles tendon tear, and so far unamazing play leave his Dolphin in doubt. Quarterback Chad Henne, another 2nd round selection in 2008, has been brilliant and erratic. His first year as a starter wasn’t Dan Marino like. Where will he go from this point? Defensive Backs Vontae Davis and Sean Smith* were 1st and 2nd round selections in 2009 and started every single game. The Miami Dolphin pass defense was ranked 25th in the NFL in 2008 and was worse last year. Are these guys going to step up? Jake Long is the one unqualified draft success Sparano and Parcells have to date in Miami. I’m not optimistic they have changed the Dolphins much from the disastrous Dave Wanstedt-Nick Saban-Cam Cameron days. My prediction for Miami in 2010- 6-10. 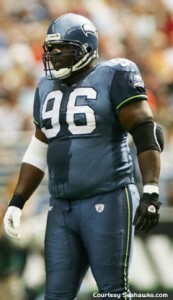 Update- Smith has lost his starting job to 2006 First Round pick Jason Allen. This doesn’t reflect well on Smith. Allen has spent almost all of his four NFL years on special teams and is easily rated as a draft bust. 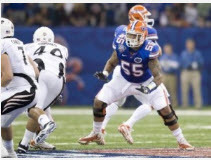 The Palm Beach Post article today went on to say Smith is now 4th on the depth chart.